Our normal body core temperature: 37 oC. We detect heat and cold differently. 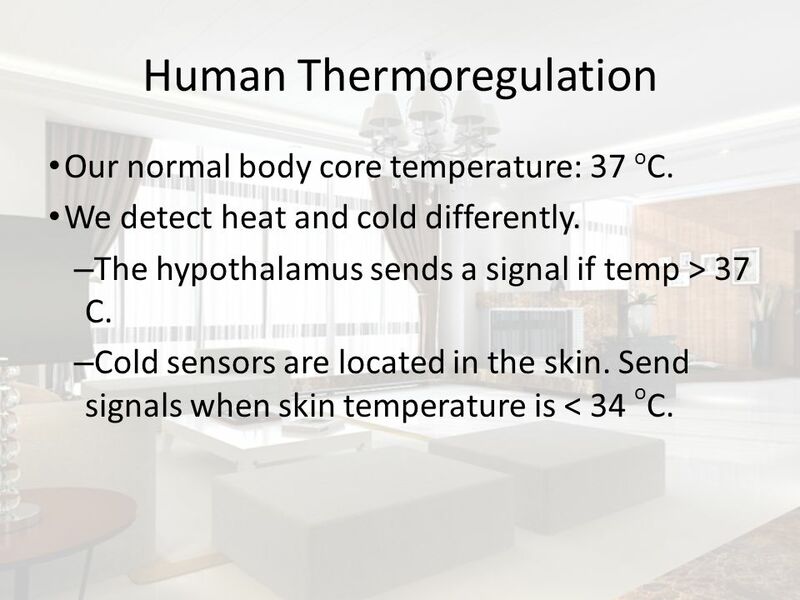 The hypothalamus sends a signal if temp > 37 C. Cold sensors are located in the skin. Send signals when skin temperature is < 34 oC. Goal is to maintain 37 Celcius. 39.5 C can be disabling and 42 C can be fatal. Skin temperature can widely. Sources of heat are the liver, brain and the heart, and the muscles. Muscular work efficiency is 20%. The rest is all heat. Humans have a remarkably well-adapted ability to tolerate heat compared with other primates Thermoregulation is achieved by balancing the two main factors that determine body temperature – the metabolic heat produced and the rate of heat loss..
How does the environment influence our body temperature? There must be a state of heat balance. (equation in the textbook). Heat may be gained or lost. 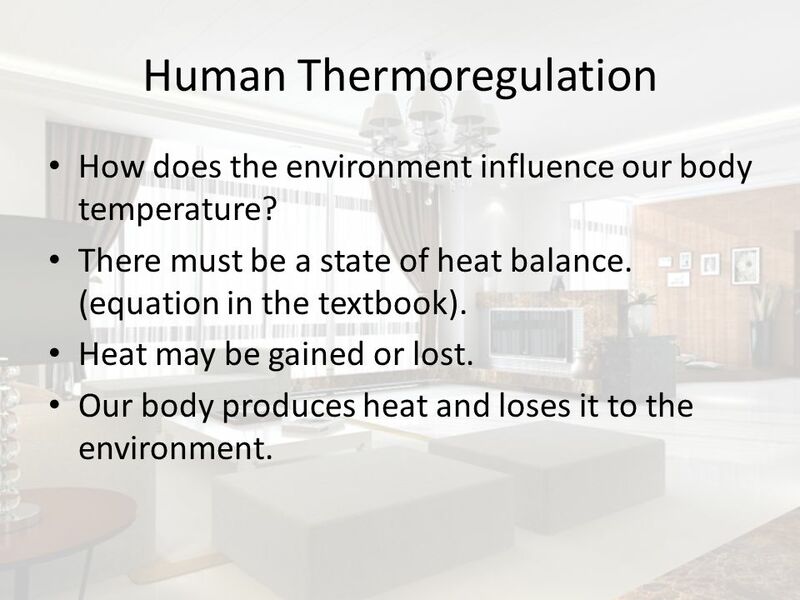 Our body produces heat and loses it to the environment. Convection = transfer of heat through the movement of air/fluids Radiation = heat transfer by electromagnetic waves or photons. If the skin of a resting person is warmer than the surrounding air, the air at the skin surface is warmed by the conduction of heat from the skin. 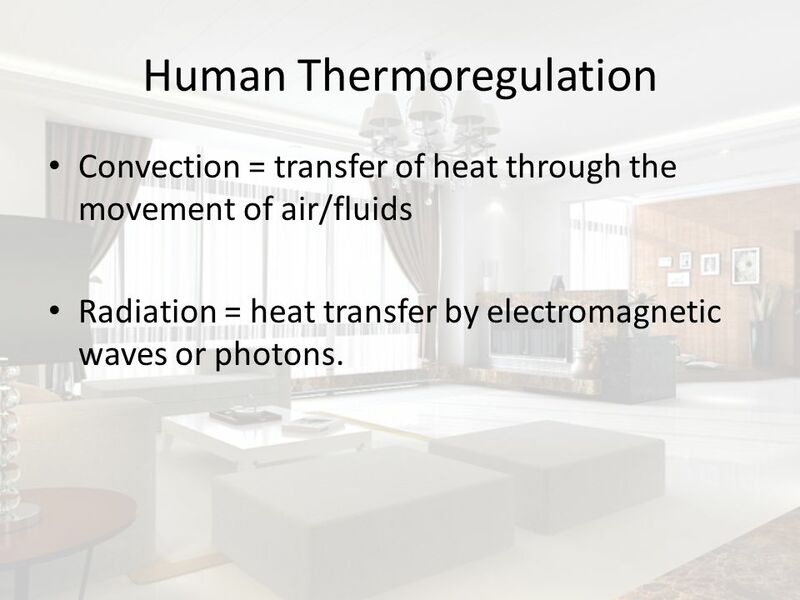 Since warm air rises, a flow of air around the person is established and heat is convected away from the person’s body. Cool air moves closer to the skin to replace the rising warm air. This air flow is known as a convection current. Everything emits radiation. In steel and glass manufacture,furnaces are a major source of radiant heat. 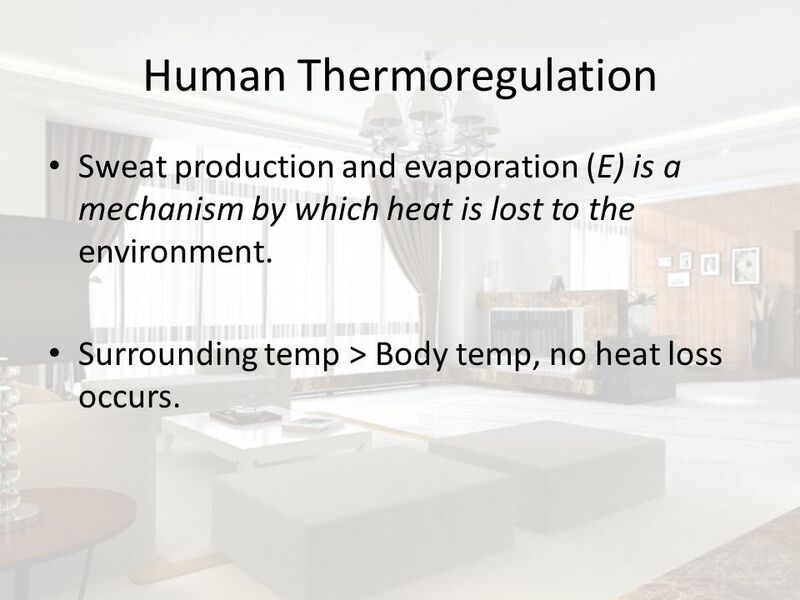 Sweat production and evaporation (E) is a mechanism by which heat is lost to the environment. 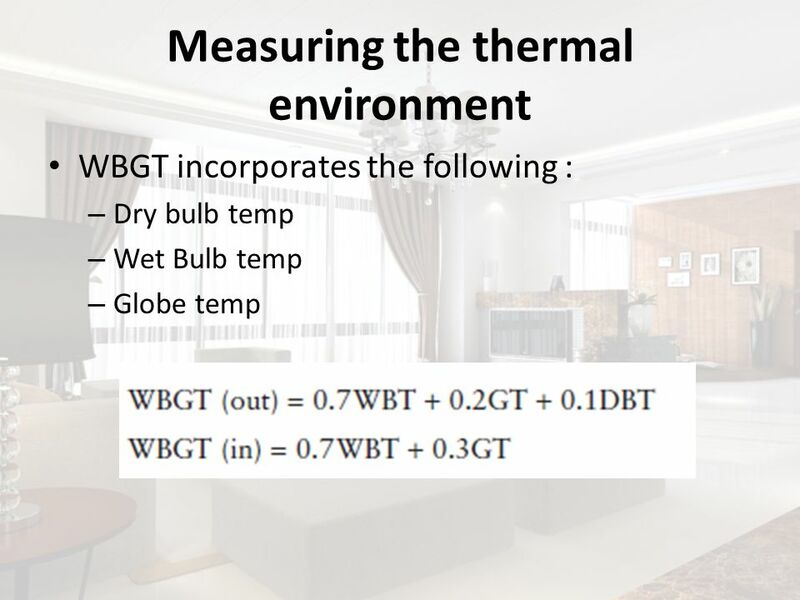 Surrounding temp > Body temp, no heat loss occurs. In a cold environment, metabolic heat production takes place by shivering, or some physical activity. Heat loss can be reduced by wearing heavy clothes (convection and radiation is reduced). How about work in foundry? How to solve the problem? Clothing reduces heat loss to the environment by trapping air in the clothing fibres and between the garment and the skin. This disrupts the flow of convection currents and maintains a layer of warm air around the skin surface. Clothing also absorbs some of the radiant heat from the body. 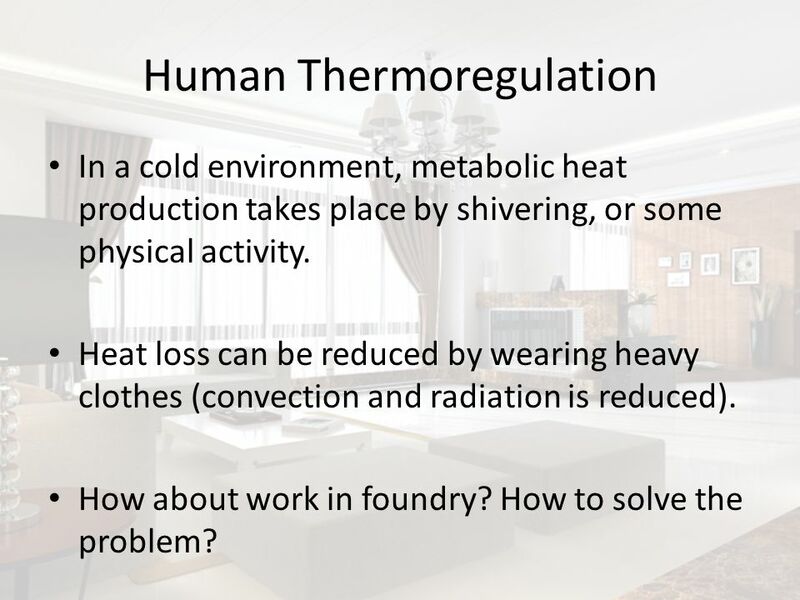 In manual work in hot conditions (in a foundry, for example) there is a high rate of metabolic heat production as well as heat gain from the environment (by radiation). 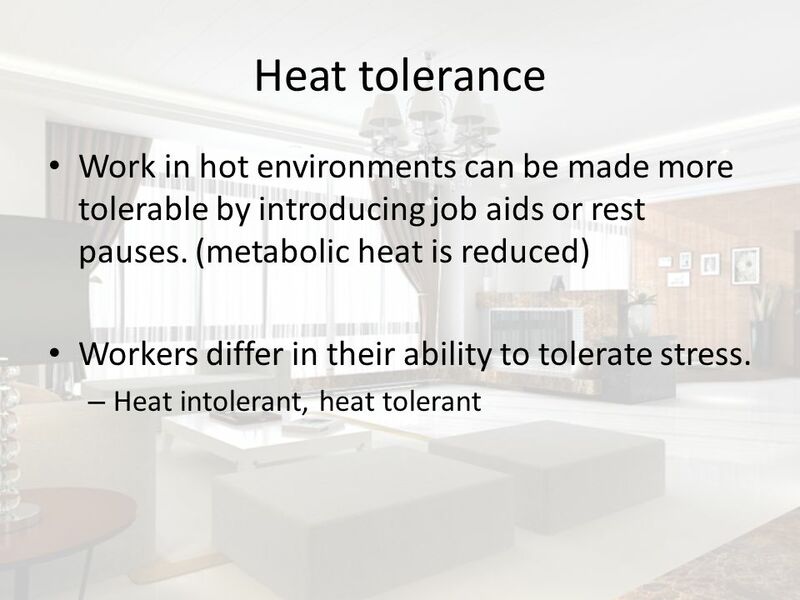 A state of thermal balance can be obtained either by reducing the rate of metabolic heat production (by reducing the work rate or introducing rest pauses) or by protecting the worker from the radiant heat (by means of a protective suit, for example). 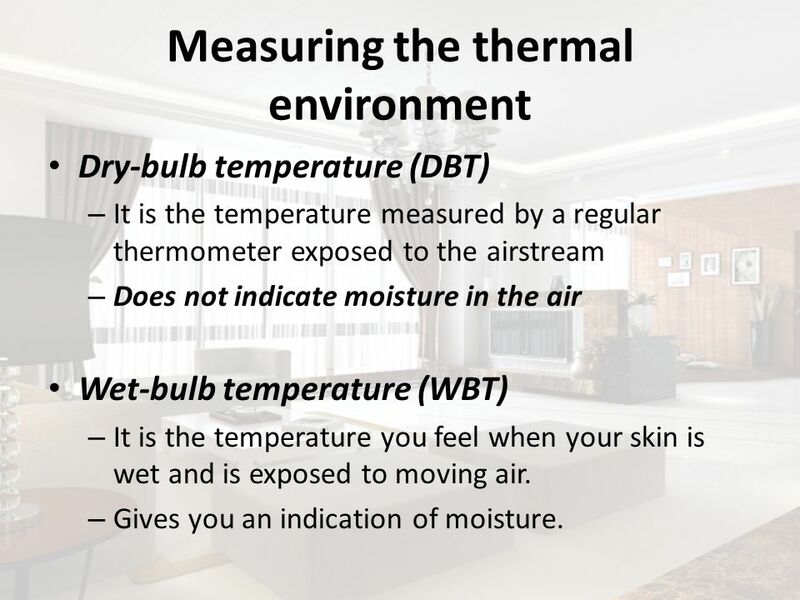 Dry-bulb temperature (DBT) It is the temperature measured by a regular thermometer exposed to the airstream Does not indicate moisture in the air Wet-bulb temperature (WBT) It is the temperature you feel when your skin is wet and is exposed to moving air. Gives you an indication of moisture. 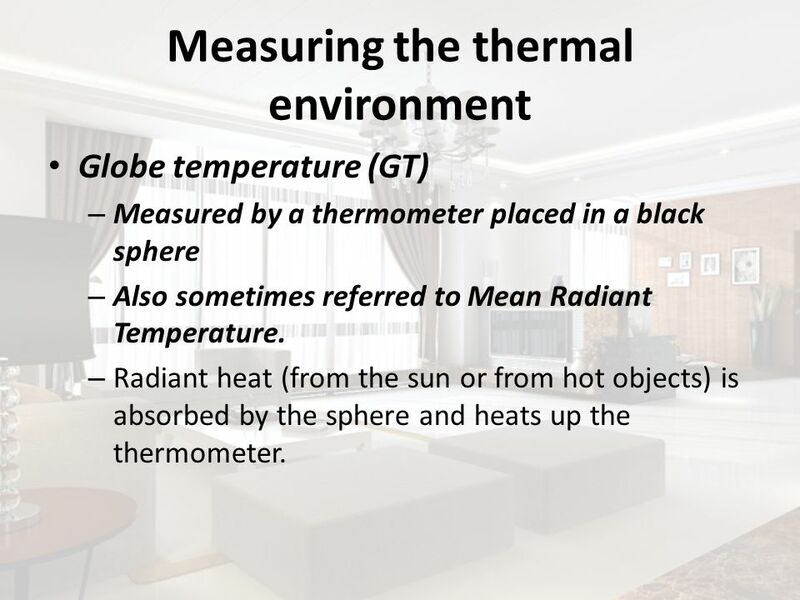 Globe temperature (GT) Measured by a thermometer placed in a black sphere Also sometimes referred to Mean Radiant Temperature. Radiant heat (from the sun or from hot objects) is absorbed by the sphere and heats up the thermometer. 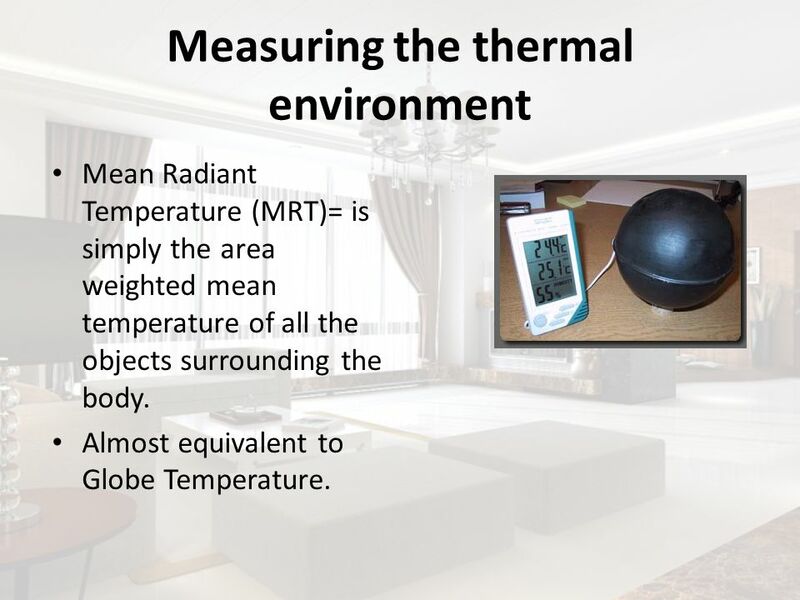 Mean Radiant Temperature (MRT)= is simply the area weighted mean temperature of all the objects surrounding the body. Almost equivalent to Globe Temperature. 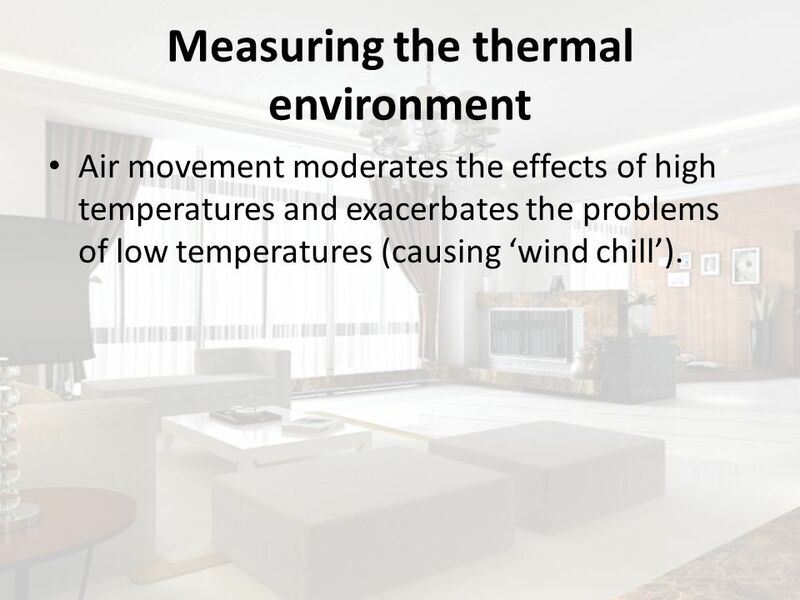 Air movement moderates the effects of high temperatures and exacerbates the problems of low temperatures (causing ‘wind chill’). 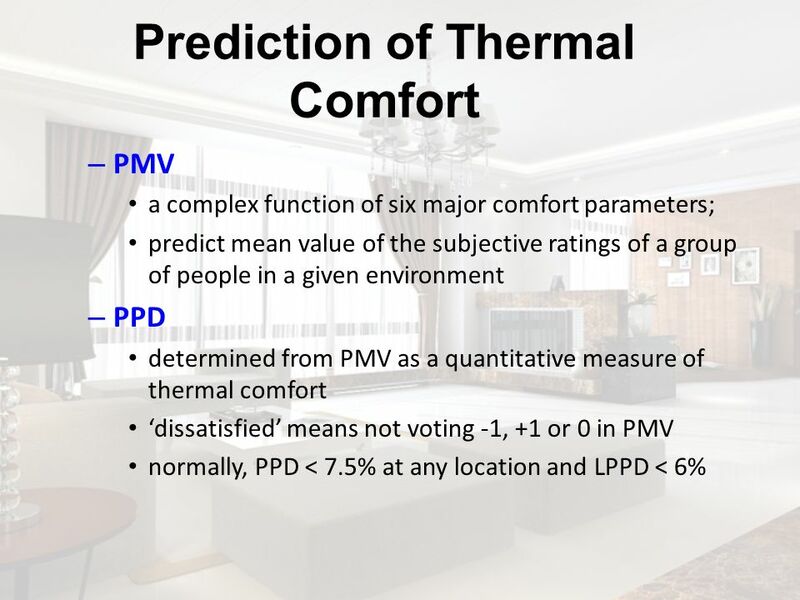 15 What is Thermal Comfort? 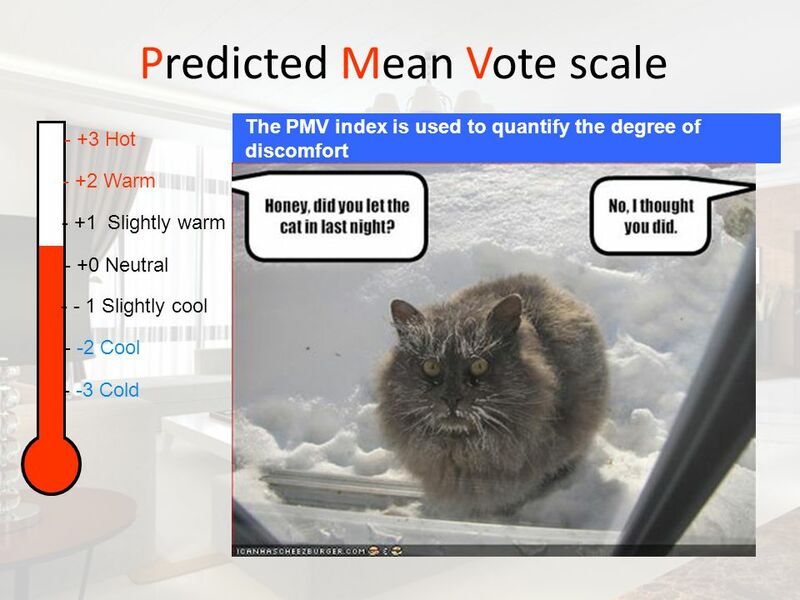 21 PMV and PPD PMV-index (Predicted Mean Vote) predicts the subjective ratings of the environment in a group of people. 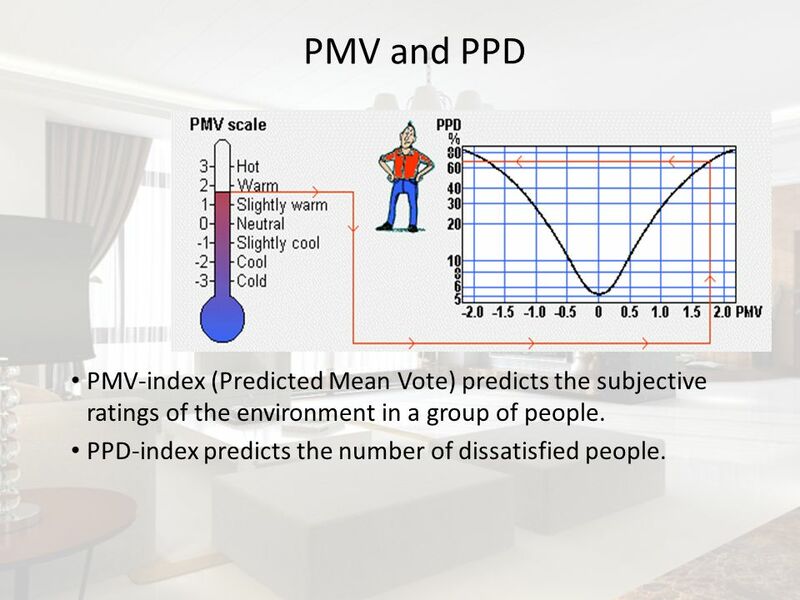 PPD-index predicts the number of dissatisfied people. 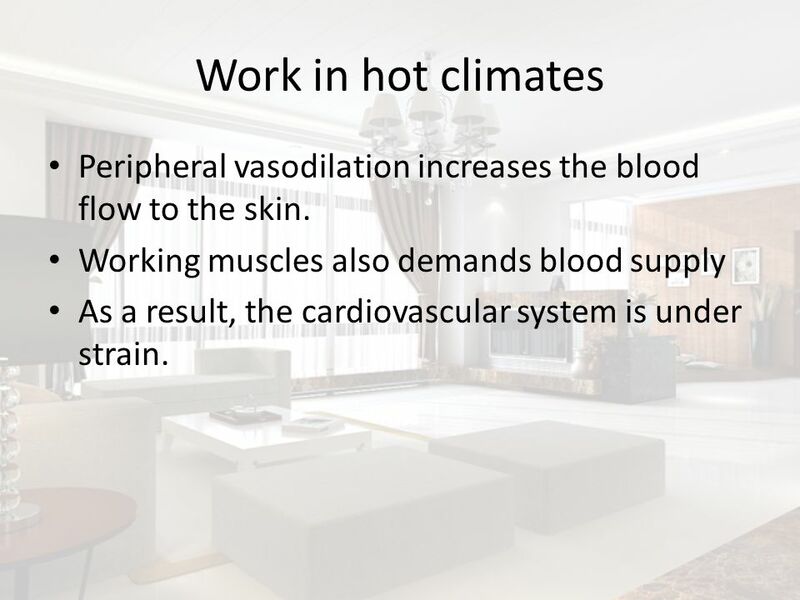 23 Work in hot climates Peripheral vasodilation increases the blood flow to the skin. Working muscles also demands blood supply As a result, the cardiovascular system is under strain. 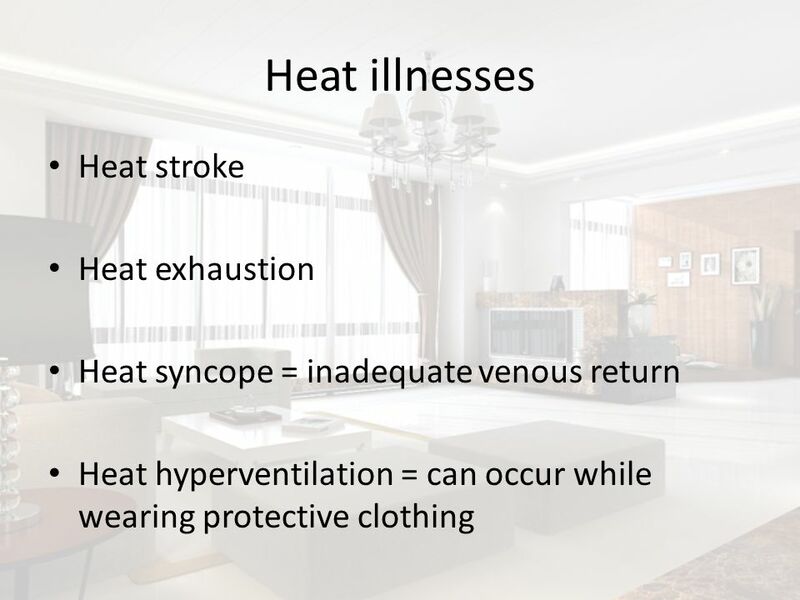 Heat syncope = inadequate venous return Heat hyperventilation = can occur while wearing protective clothing If core temperature rises above 42°C, blood pressure drops and insufficient blood is pumped to the vital organs, including the heart, kidney and brain. 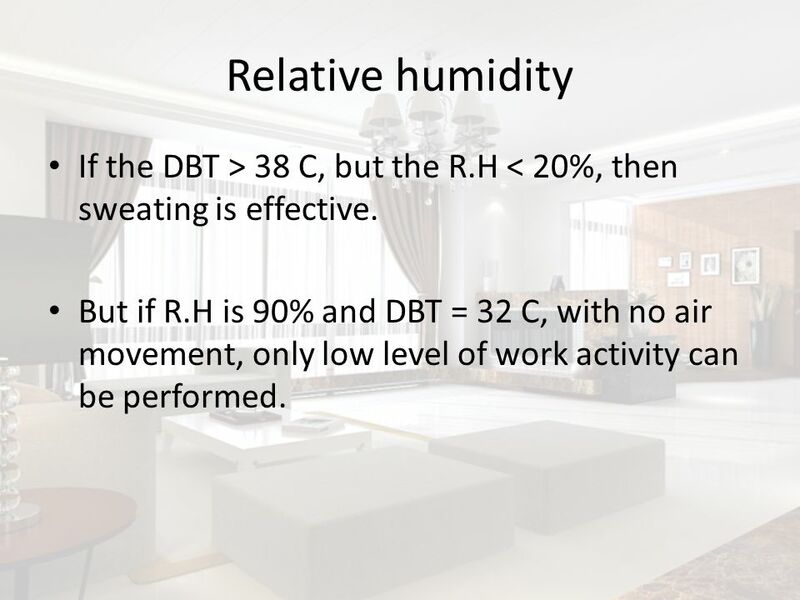 25 Relative humidity If the DBT > 38 C, but the R.H < 20%, then sweating is effective. 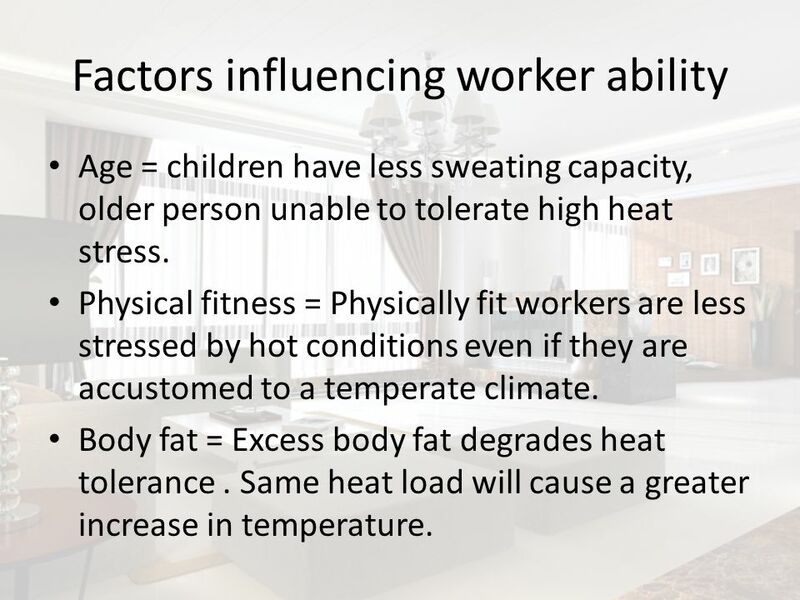 But if R.H is 90% and DBT = 32 C, with no air movement, only low level of work activity can be performed. 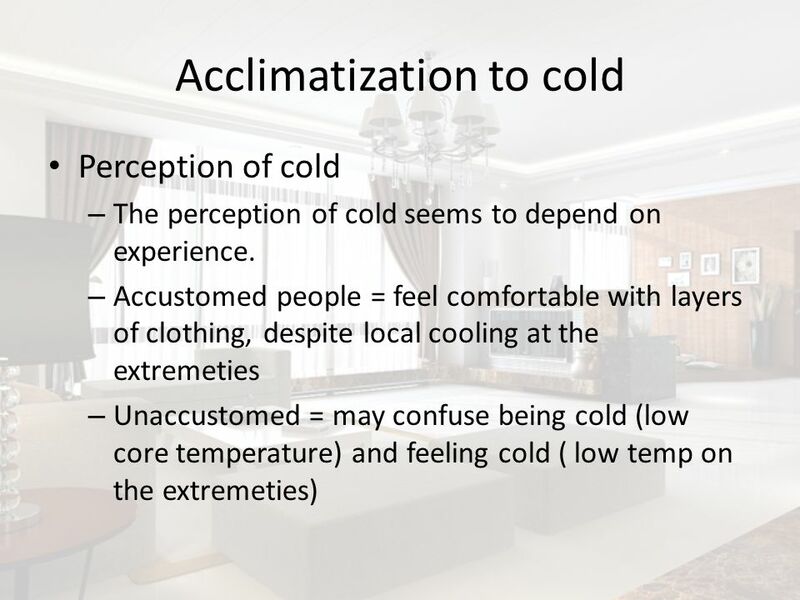 27 Heat acclimatisation Heat acclimatisation is a physiological process of adaptation rather than a psychological adjustment to life in a hot environment. It involves an increase in the capacity to produce sweat and a decrease in the core temperature threshold value for the initiation of sweating. 28 Heat acclimatisation A state of acclimatisation is best achieved by exercising in the heat and drinking plenty of fluid. 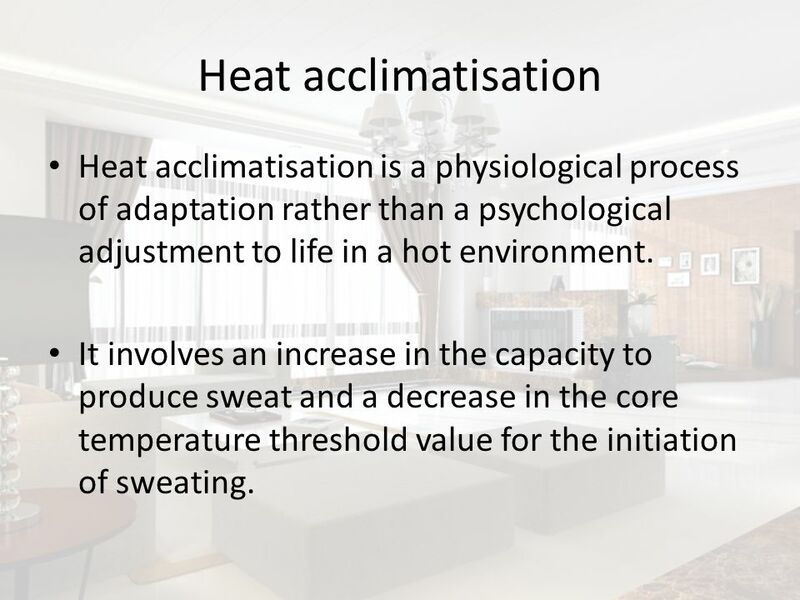 Heat acclimatisation occurs naturally but it may also be induced artificially. 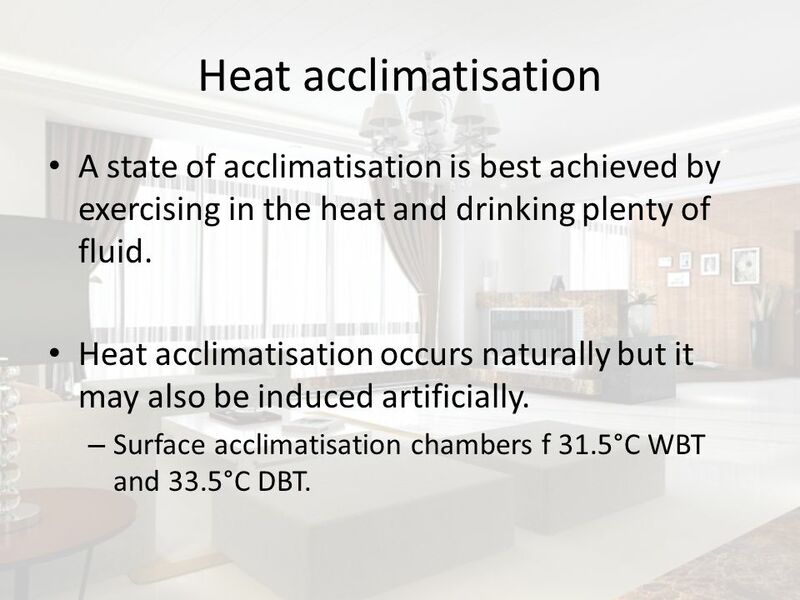 Surface acclimatisation chambers f 31.5°C WBT and 33.5°C DBT. It has been suggested that an individual’s ability to produce sweat depends on the climate they experienced in the early years of life (Diamond, 1991). People who grew up in a hot environment develop a larger number of functional sweat glands than those who grew up in a cold environment, and can tolerate hot conditions more easily. Age = children have less sweating capacity, older person unable to tolerate high heat stress. Physical fitness = Physically fit workers are less stressed by hot conditions even if they are accustomed to a temperate climate. Body fat = Excess body fat degrades heat tolerance . Same heat load will cause a greater increase in temperature. 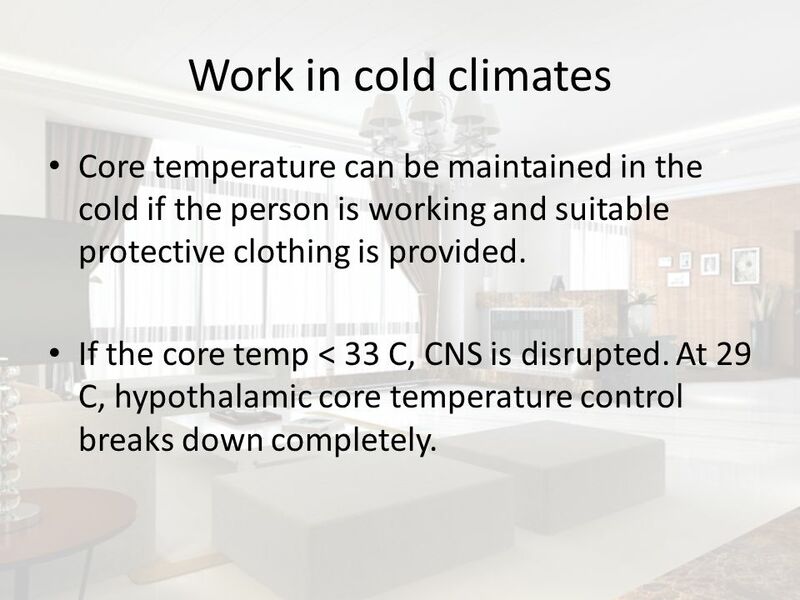 31 Work in cold climates Core temperature can be maintained in the cold if the person is working and suitable protective clothing is provided. If the core temp < 33 C, CNS is disrupted. 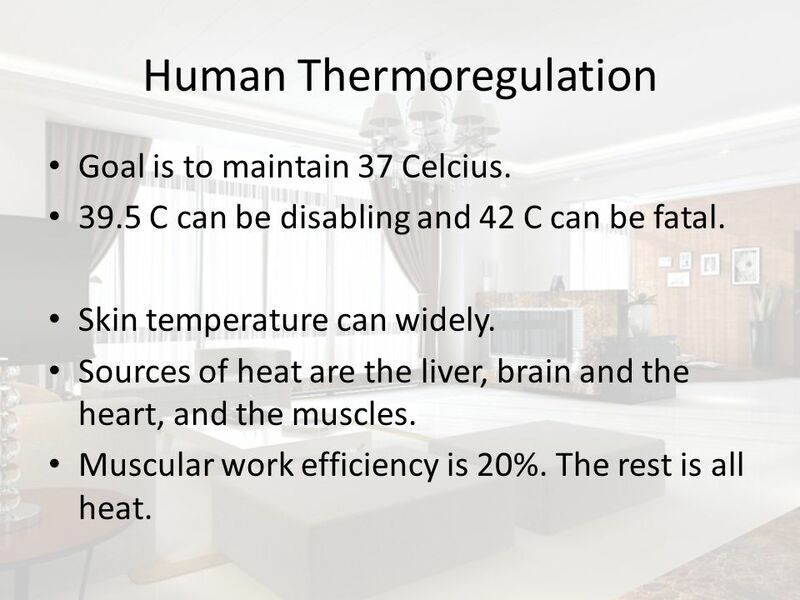 At 29 C, hypothalamic core temperature control breaks down completely. 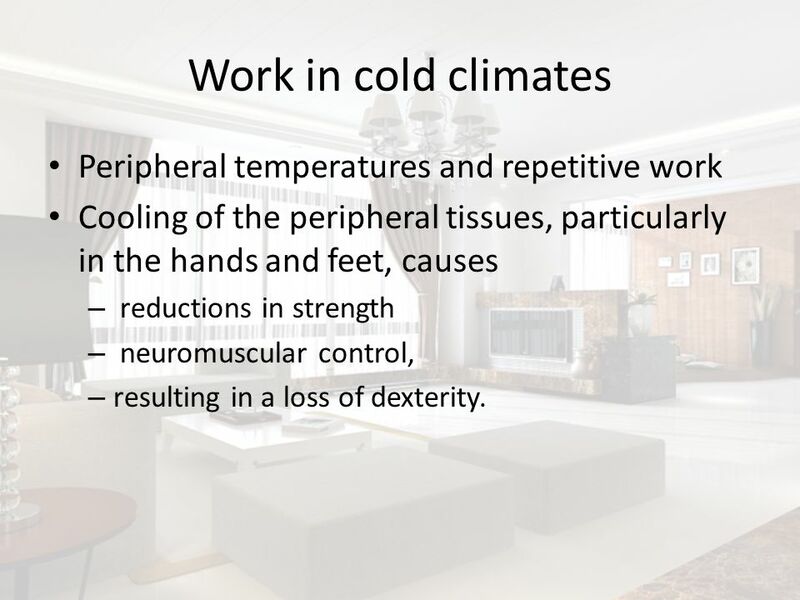 Cooling of the peripheral tissues, particularly in the hands and feet, causes reductions in strength neuromuscular control, resulting in a loss of dexterity. Dexterity = Skill in performing tasks, esp. with the hands. 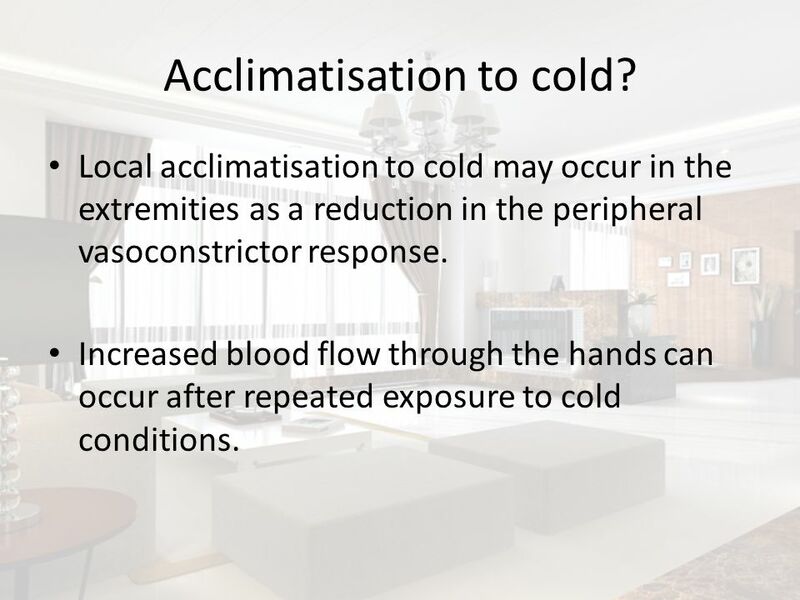 Local acclimatisation to cold may occur in the extremities as a reduction in the peripheral vasoconstrictor response. Increased blood flow through the hands can occur after repeated exposure to cold conditions. It may also be the case that those exposed to a cold climate increase their daily food intake, which would increase their metabolic rate and the thickness of the subcutaneous fat layer resulting in a higher rate of heat production and better insulation of the core tissues. 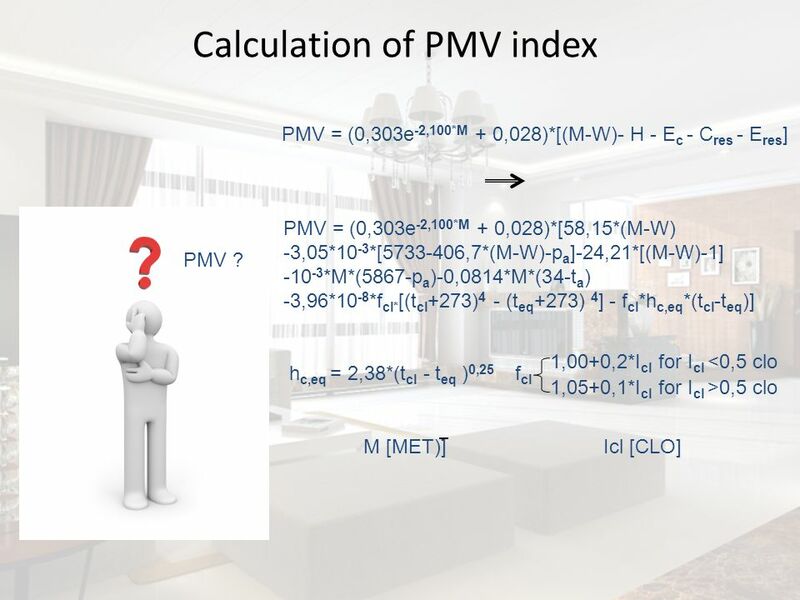 Up to 25% of heat loss takes place at the head. During cold temperatures, peripheral vasoconstriction takes place. 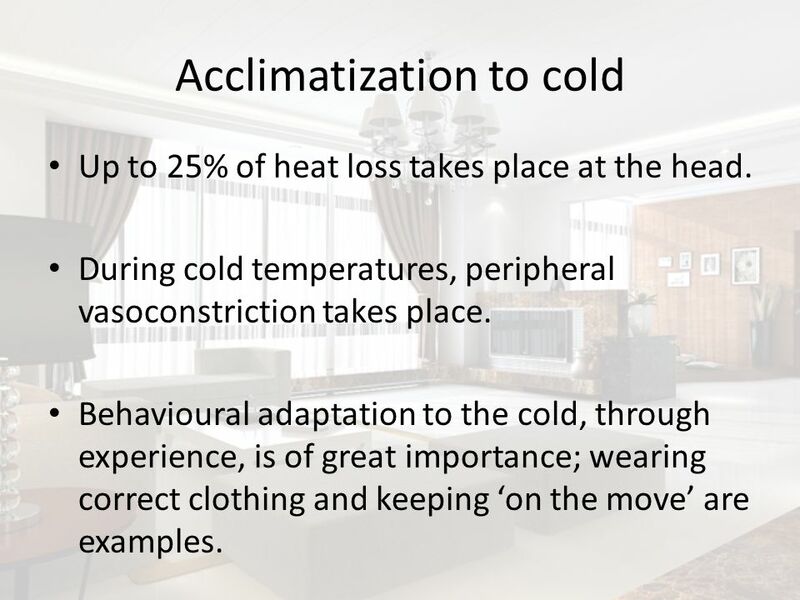 Behavioural adaptation to the cold, through experience, is of great importance; wearing correct clothing and keeping ‘on the move’ are examples. 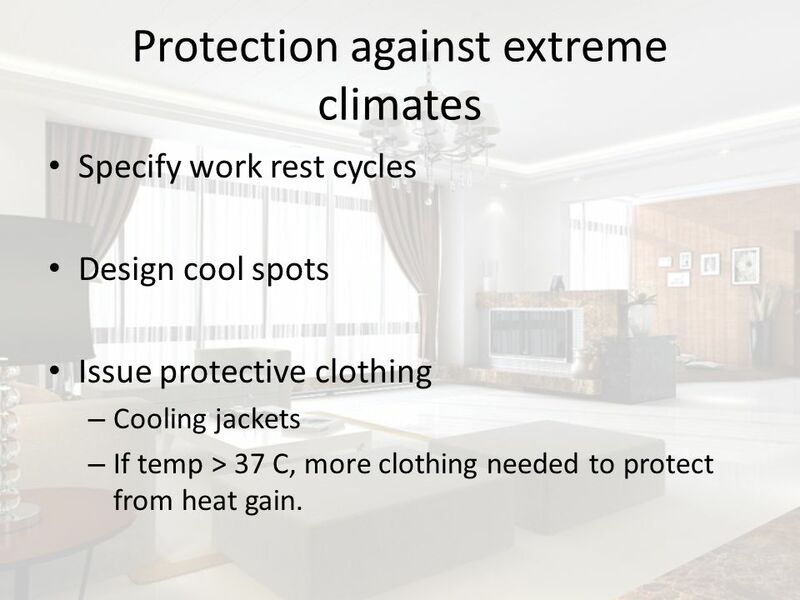 Specify work rest cycles Design cool spots Issue protective clothing Cooling jackets If temp > 37 C, more clothing needed to protect from heat gain. 37 Ohnaka et al. 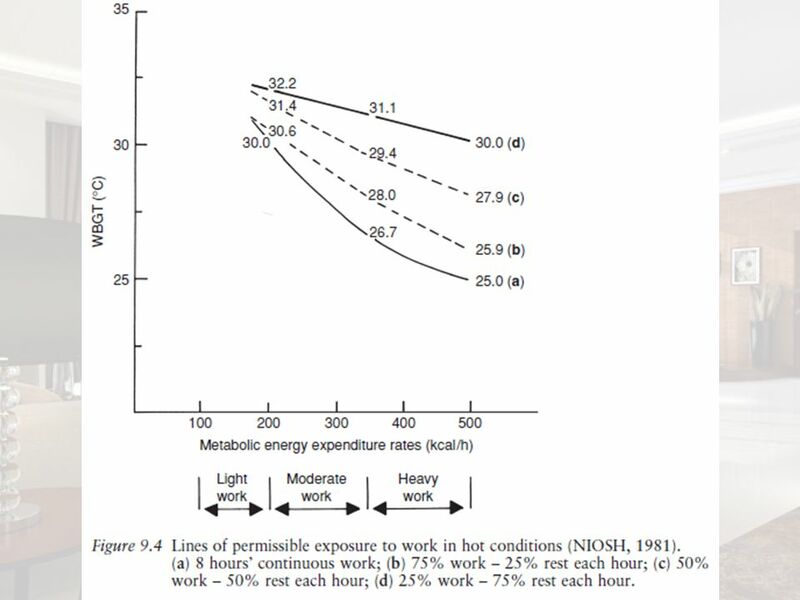 (1993) investigated heat stress among operators in the asbestos removal industry. These workers wear protective clothing to prevent the inhalation of asbestos and the contamination of personal clothing. The protective ensemble consists of impermeable garments and air masks, preventing heat loss and exacerbating the problems of working in hot weather. Several solutions to the problem were possible including air conditioning the work area, using air-cooled or liquid cooled suits or ice vests or constructing a cool room adjacent to the work area for rest breaks. The first option was too expensive and the second was impractical due to the restrictive nature of the clothing. The third option was trialled and evaluated using measures of heart rate, sweat rate and rectal temperature of subjects working in hot conditions, cool conditions and the ‘hot-cool condition using the air-conditioned rest room. 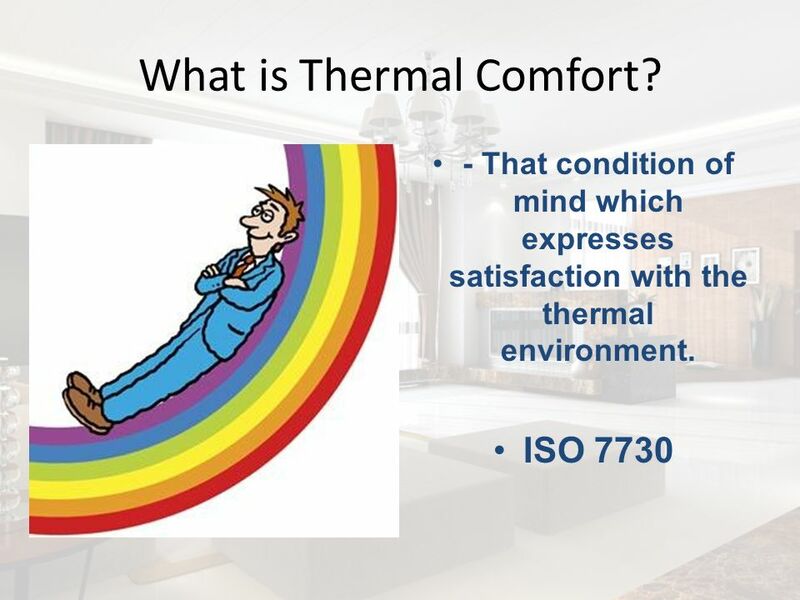 The hot-cool condition reduced physiological stress and discomfort significantly. 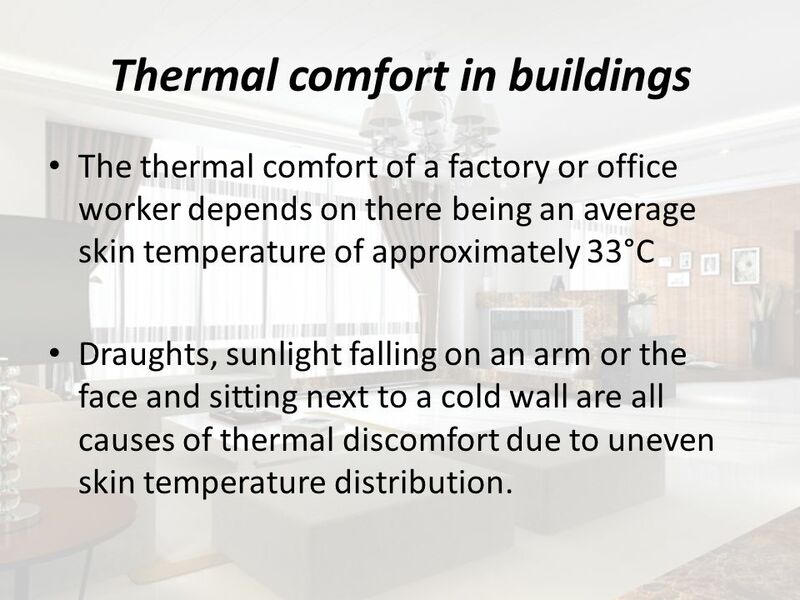 The thermal comfort of a factory or office worker depends on there being an average skin temperature of approximately 33°C Draughts, sunlight falling on an arm or the face and sitting next to a cold wall are all causes of thermal discomfort due to uneven skin temperature distribution. 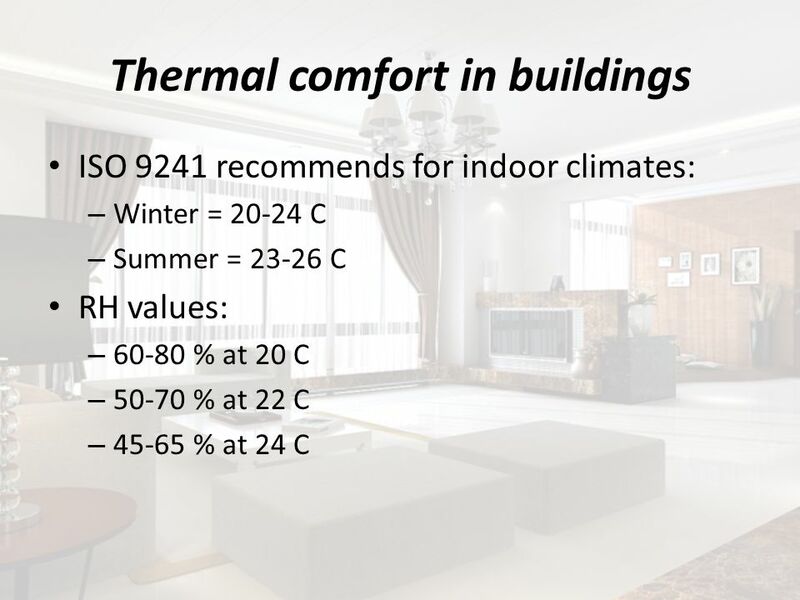 ISO 9241 recommends for indoor climates: Winter = C Summer = C RH values: 60-80 % at 20 C 50-70 % at 22 C 45-65 % at 24 C Investigations have shown that some people find temperatures as low as 18°C comfortable whereas others prefer temperatures higher than 23°C. 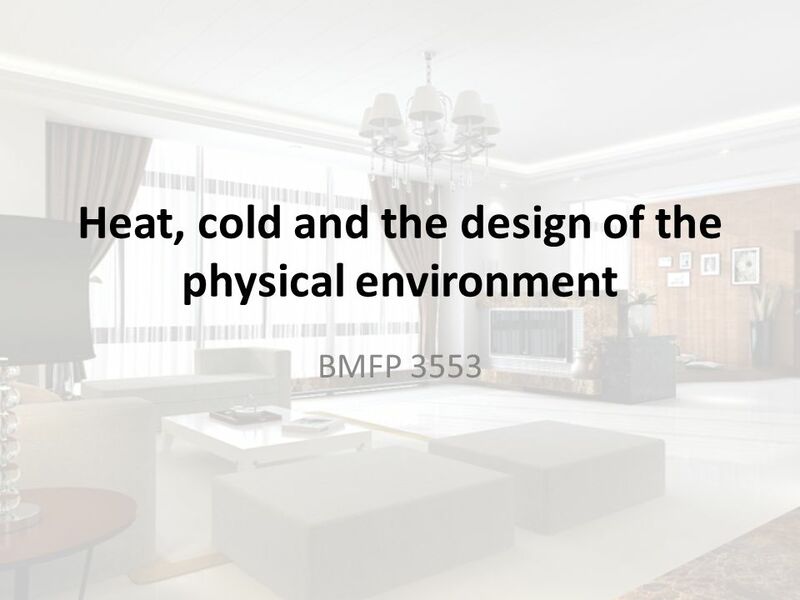 Download ppt "Heat, cold and the design of the physical environment"
© 2011 National Safety Council 15-1 ENVIRONMENTAL EMERGENCIES LESSON 15. THERMOREGULATION Control of body temperature © 2008 Paul Billiet ODWSODWS. When things work... Honda COG Commercial Homeostasis homeostasis – constant physiological adjustments of the body in response to external environment. 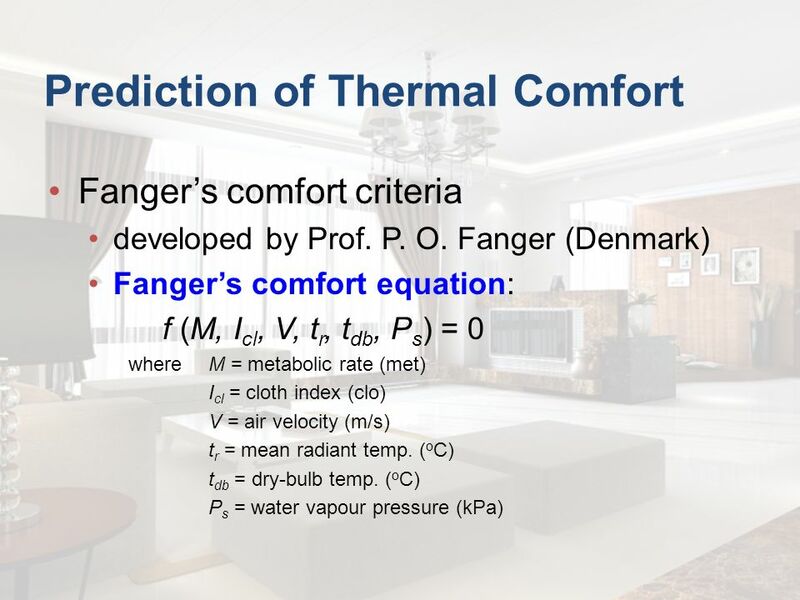 The maintenance of a particular temperature in a living body. Exercise Thermoregulation, Fluid Balance, and Rehydration Chapter 10 Part 1. The way in which we exchange heat with the environment is just different. Wind Chill Temperature is: The temperature it "feels like" outside and is based on the rate of heat loss from exposed skin caused by the effects of wind. 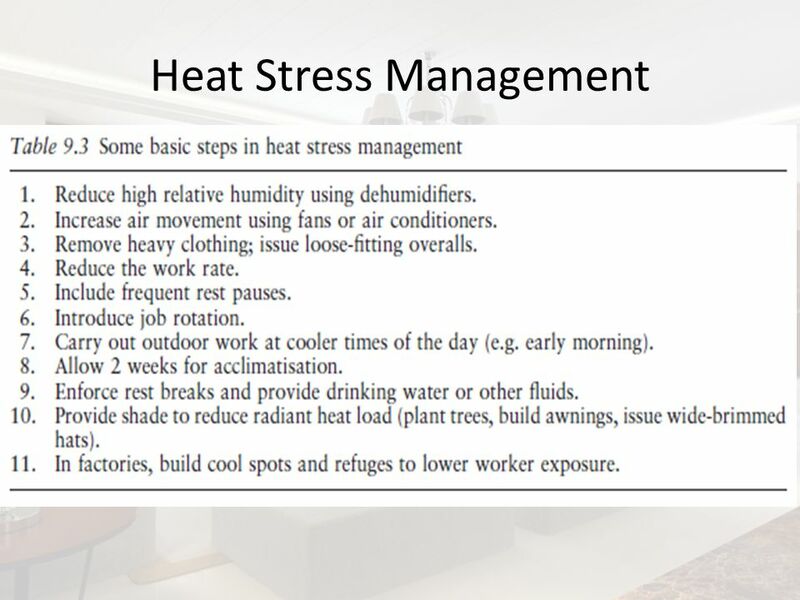 Heat Stress UW-Eau Claire Facilities Management By: Chaizong Lor, FM Safety Coordinator. Detecting Temperature Change. External temperature change Skin is the barrier between our body and the external environment and can be 2 or 3 degrees. Chapter 17 Environment and Exercise. Key Concepts. 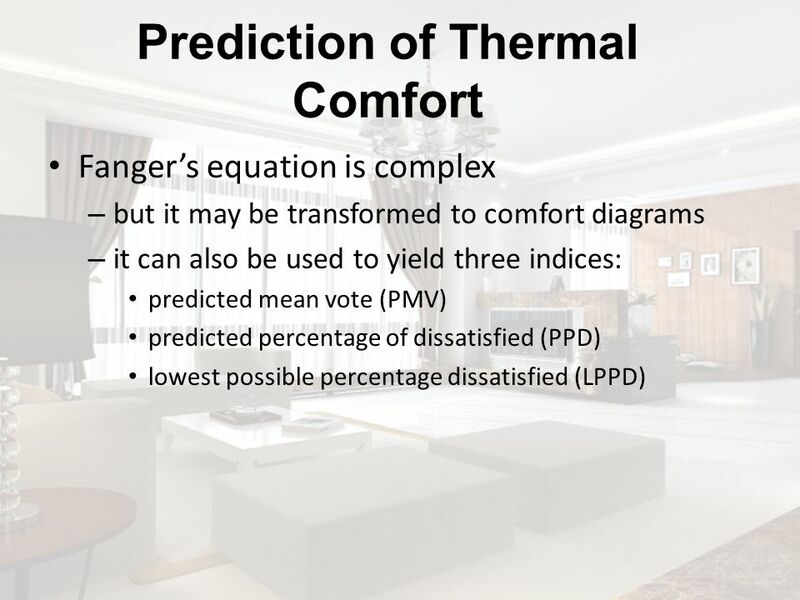 Environmental Controls I/IG Lecture 6 Thermal Comfort. BASIC PRINCIPLES IN OCCUPATIONAL HYGIENE Day THERMAL ENVIROMENT. 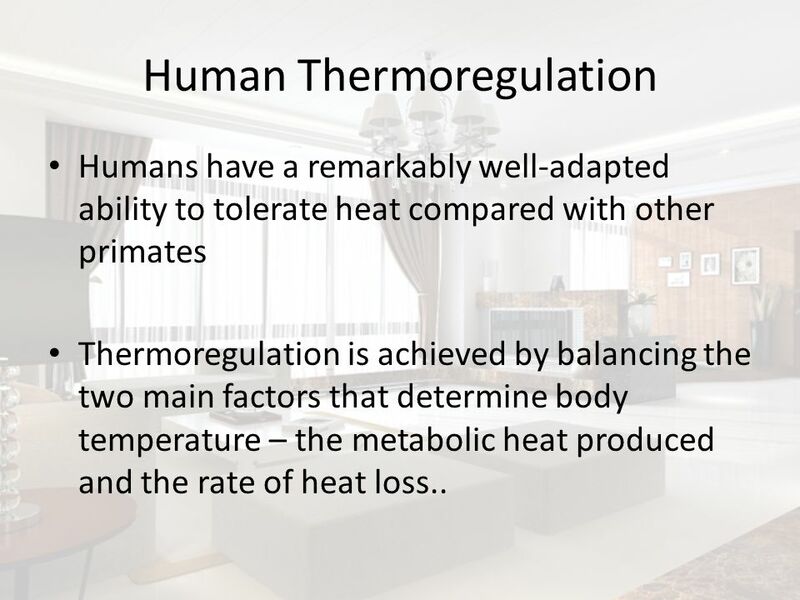 Work Physiology – Thermal Ergonomics An Introduction to Human Thermal Environments Ollie Jay Laboratory for Exercise and Environmental. 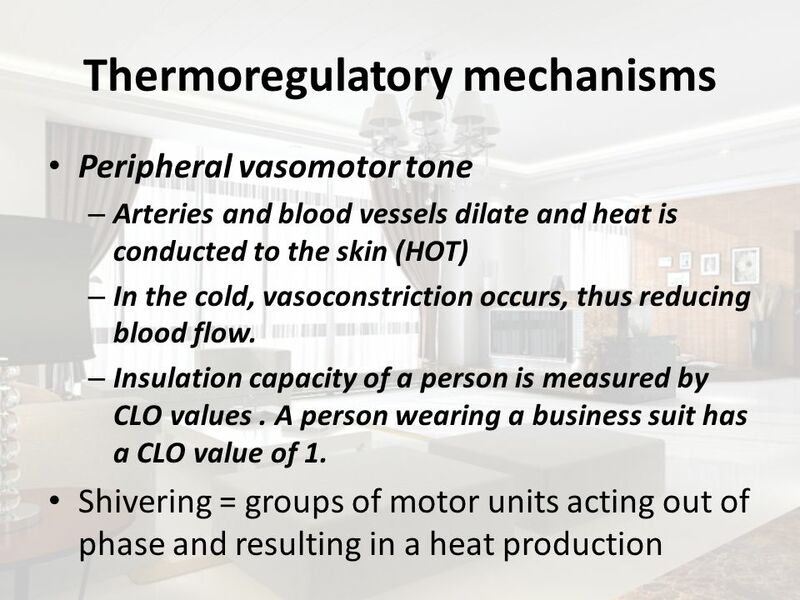 Heat Loss How heat is lost from the body Evaporation (25%) Radiation (60%) Heat waves Convection to air (12%) Conduction to object (3%) Convection to air.